Living outside New York City, I lament the fact that my suburb is fairly homogenous when it comes to restaurant options—but for some, the ability to have pad see ew, injera, or even a decent spicy tuna roll at arm’s length isn’t a selling point. Today’s guest contributor, Kevin Brown, runs the Berlin Mitte cocktail bar with a Californian twist, Redwood, and shares his observations as an American in Berlin. Each Berlin summer brings more and more visitors from New York who think, “This place is so great. Why don’t we live here?” The former East Berlin district of Prenzlauer Berg has become associated with the kind of casual professional urbanity that they often see as a more affordable variant of Brooklyn’s Park Slope, with more trees. The former West Berlin district of Neukölln is the Williamsburg that never was. But Berlin is not one of New York’s boroughs. This German city is closer to Poland than Kassel. This is a northern city: Berlin’s on the same parallel as the Aleutian Islands, Labrador, and the Ukraine. The Cold War division of the city might still be said to affect daily life. And while Berlin is not the factory of the resilient German economy, residents and visitors are very happy to keep it as a 344-square-mile playground. 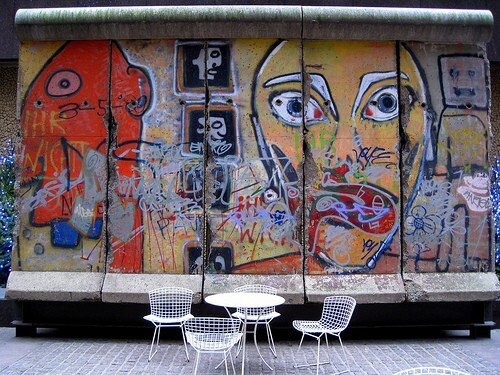 Though the defiant, ad hoc ways of the ’90s might be gone—no Love Parade, fewer squatted apartment houses—the city remains a place where even Germans see conservative attitudes as a drag. Yet cultural change is still very slow in Berlin. The city has seen its share of governmental transformations and local responses to them, but it has not hosted a large foreign population since well before living memory. That is changing. The city in its current form has the infrastructure for six million people: there are some three million there now. Who will the remainder be except foreign? And what does foreign mean for Berlin? Take the food. Italian restaurants flourish, but rarely feature much garlic. Unless everyone’s eating garlic, most Berliners would rather not smell of the stuff. French restaurants are scarce due to an association with haute bourgeoisie, but an increased number of French residents means new offerings like Chez Michel, which show the suspicious that bistro food need not cost more than a plate of ham and potatoes. Indian food is present, though not in its British variety of the curry house. The dishes are adjusted for ingredients, a reliance on spinach and frozen mangoes, and the hallmarks of local German dining—beer, particular picnic tables for outside seating in any weather but rain, and coffee—are fronted to help mediate. Mexican also exists, at least in name. Early attempts were rumored to be the work of a German entrepreneur who tasted Tex-Mex in the USA, thought it resembled Indian food, and returned to Germany to set up Mexican restaurants with Punjabi cooks. 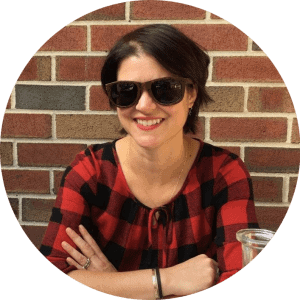 More recent attempts include Dolores, a German couples’ recreation of a San Francisco Mission District burrito bar; and Maria Bonita and Maria Peligro, an international partnership’s now-split attempts to bring the flavors, if not the ingredients, of Mexico City to Berlin. Germany is a large nation, but regrettably not a country that thinks of itself as diverse, though it is. Oktoberfest does not happen in all parts. The Franzbrötchen, a cinnamon roll beloved and abundant in Hamburg, is rarely found in Berlin. 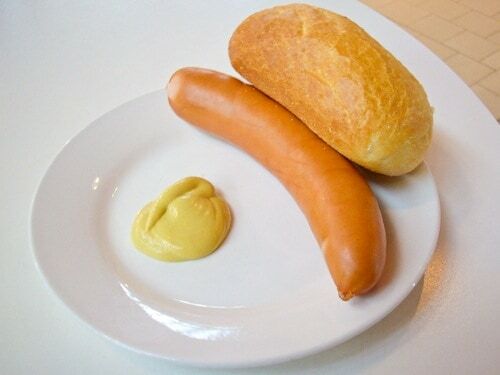 The national cultures of the prepared food of Dr. Oetker and the uniform appearance and omnipresence of Wurst might tempt some to believe in pan-German culture, but it is not the case. Culture remains local. 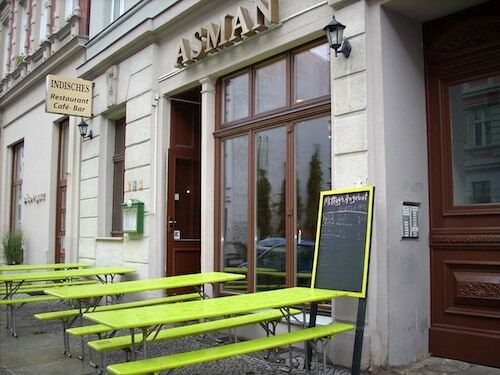 What of Berlin cuisine? There are plenty of varieties of potatoes and pickles and pig, including a sausage sliced, covered in ketchup, and dusted with curry powder, dubbed the Currywurst. Call it Berlin’s cheesesteak. There is a colorful wheat beer, actually made of after-brew, called Berliner Weiße, sweetened and colored red or green by either raspberry or woodruff syrup. Sweet woodruff, raspberry, sour cherry, rhubarb, and elderberry are all locally harvested. German juice companies provide all of these in reusable glass bottles. The companies also provide non-native juices, and Berliners often enjoy a local-meets-faraway drink called “KiBa,” that is half sour cherry (Kirsch) and half banana (Banane). The flavors marry easily, but for many visitors it’s an unsightly slurry. When something without antecedent arrives, it can be a difficult translation process. 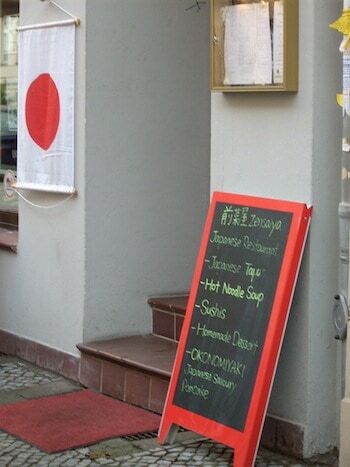 Take the case of Japanese food in Berlin. There are no daily flights from Japan, and for some critical diners that might make sushi a questionable option. There also is no supply of seaweed, so at least one restaurant substitutes boiled spinach. But Japanese cuisine includes much more than those two options, but how to explain them to Germans who have never been to Japan or even to Düsseldorf’s Japantown? The English language helps mediate between Japan and Germany, but how many times can you translate lotus root? Germans’ expectations might include filling meals, so how do you accommodate them to a cuisine that is meant to satisfy but not leave one in a blood-sugar-induced food coma? It’s not easy. One excellent restaurant, Zensaiya, has tried to use cultural analogies, calling zensai, or small dishes, “Japanese tapas” and referring to one dish as “Japanese Frikadelle,” the latter being a northern European dish of mixed beef and pork meats in a patty. Anybody for a Japanese burger? The mixture of the unfamiliar and the prosaic is too confusing, which is a loss because the food is exceptional. These are the cosmopolitan increments of a renewed Berlin. After a century of divisive politics in pursuit of the pure, the genuine, the 100% Echt, it’s a promising start.